As this is about No. 276 on my TBR pile, it's going out as a bookring, to give me a chance to get round to it, and to help declutter my bookshelves! Anyone else want to be added? Please PM me. I really enjoyed this story. Not sure if it is something that I would normally have bought myself, but I am glad I had the chance to read it. This book was waiting for me when I came back very late and very tired from a business trip - very difficult to resist the urge to just dive in! Thank you Gooner & Aubriel! I started this book today on my commute to work, and already I'm being drawn in by Dinah's voice. I may have to hide this if I'm to get any chores done this weekend! I really liked Dinah. She was perceptive, loving and with a great voice. Or at least, for the first two thirds of the book. After the death of Shalem, the book seemed to lose it's way. There was too much "and so the months and years passed" which got a little dull. But the first section, about her life in the encampment with her mothers and the family was great - it seemed a very warm, vibrant and evocative memoir of a time that isn't well documented at all. I think I'd give it an 8.5 really! Thanks so much Gooner for giving me the opportunity to read this! On it's way to akg - enjoy! Got this today, 4th ring in 10 days so it might take me a while to get round to it. Let me know if anyone else is added to the list and I'll see if I can more it up the list. I am looking forward to reading this as it has been recommended to me for a long time. This book is narrated by Dinah; the first section is about her mother and three aunts and the second section about her own story. Although the story has happy and uplifting moments it also has many moments of distress and great upheaval to the main characters. The story begins with the arrival of Jacob at his uncle Laban’s camp. He marries two of Laban’s daughters (and is given the other two as dowries). Obviously having four sisters as wives leads to jealously but also great bonding and unity. Out of the thirteen living children the four women have, Dinah is the only daughter, and is therefore important to all of them as she will learn their stories. However, life doesn’t run as smoothly as expected. There is conflict between Jacob and his father in-law and then between Jacob’s sons. This is unsettling to the women and after experiencing both love and tragedy Dinah travels to Egypt where she earns respect and fame from her practise of midwifery. I admit I found the book confusing to start with as there were so many characters and was glad there was a family tree at the beginning of the book, but the characters soon developed their own personalities, especially the women. 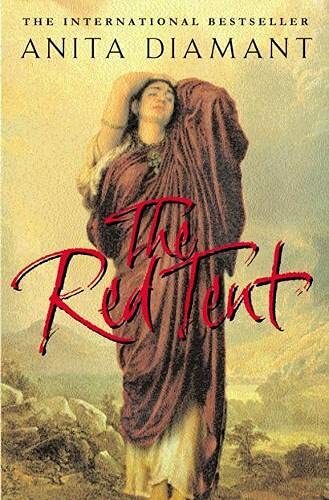 The culture of the red tent was fascinating to read about and how attitudes were changing from this old way of life to the new religion of Abraham (Jacob’s grandfather). However it is not the best book I have read this year. I'd agree with both Beebarf and AKG - I won't try and better AKS's synoposis! I was also always flicking to the family tree at the front! I really enjoyed the book, I thought the writing was exceptional - warm, perceptive, descriptive. This really is a book that tells the female side of the story, history from her point of view, ie the outsider, the one without power. Having said that, this story illustrated the different power that the women had, particuarly with reference to the skills of the midwives. It also celebrated their relationships and friendships, but also the jealousy between wives. I thought it was a really uplifting story of women's uniqueness, power and life. Stayed up late last night to finish it - one of those books that you just don't want to end. Just going to go to the original source (Genesis 34) to read the male account of Dinah's history! If you go to this link on Amazon, you can hear Anita Diamant talking about the Red Tent - very cool! Gooner, can you PM me your address please? I've sent you a couple of messages. I'm worried they're not getting through! The red tent is now winging its way back to Gooner! This arrived safely a couple of weeks ago. Apologies to nice-cup-of-tea who is still anxious about whether it arrived. I was so sure I'd acknowledged safe arrival that I put the book back onto my shelf. Sorry! Thanks so much for returning it to me. I hope to read it myself quite soon, unless anyone else wants it first? Oooh! This arrived this morning, I am already itching to get reading! :) First 'catch' for me, so I'm doubly chuffed! Well, I will make the month limit... I thought I had gone over it. Anyway, I quite enjoyed this book and found that many elements of it were familiar. The story based on the story of Jacob's daughter Dinah was sometimes touching, sometimes infuriating - as I wanted to slap various members for doing the wrong thing. I got a little bit lost towards the end. I'm not sure if it was due to moving house and being unable to locate it for a week, or whether it was down to the story, but I just lost enthusiasm for it as events plowed towards the end. Nonetheless I would recommend the book. Will try to post this on to Normy tomorrow. Sent in the post to Normy second class. I'm finishing another bookring first, then this and Brick Lane are next. Well, once I'd started this there was no question of alternating - I could hardly put it down. I was up until 6am reading it. This is Anita Diamant's first novel - her other works have been journalism and books about 'contemporary Jewish life'. I don't normally get this excited about novels, but this is the second of two good ones recently (the other being The English Patient), and probably one of the most enjoyable pieces of fiction I have read. Diamant has really done her homework about what life must have been like for women of that era. It really brings the Bible stories to life - the laughter, tears, jealousies, friendships. Each woman is given her own unique character, as are the men, but the women are the focus. I wonder what made her choose the story of Dinah? Perhaps it's ~because~ so little is known about her - maybe it was easier to write a novel. The Bible often seemed to me to be very matter of fact, or else blatantly euphemistic. Bits were missed out that probably didn't need explaining at the time, but now are essential to understanding the way of life. Living in tents, herding, husbandry, sharing a husband, customs of the time, even the way people worshipped their gods and the whole culture of god and goddess worship at the time. From reading the Bible I could get the impression that the Judeo-Christian God was the main god in that culture, and there were a few tribes here and there that worshipped idols. But that's because it's the story of the Judeo-Christian God, and not a historical account. I don't think you'll get much religious renewal from this book though, if that is what you're after, as this is the other way round from how I've described the Bible - it's about what everyday life was like, rather than about God. If your scripture is the Bible it could enhance your readings, but it's certainly no impediment to the reader not to be of any particular religious persuasion. Bear in mind it's not 'historical' but a novel based on elements of Genesis. (Thanks for the tip about which chapter Dinah is in - I read that first). ~Do~ read this book, Gooner, it really helps the Genesis stories come alive and gives the people in it their voice, and their faces come alive, you see their clothes, their homes - wow!. I'm now searching out other novels like this of other Bible stories as I'd like to read some more along these lines (and more Anita Diamant fiction too), and I'm a Buddhist! Back to Gooner? Or awaiting another person to be added to the ring? On its way to Pookledo shortly. Received in the post yesterday. Thankyou! I've never given a book ten out of ten before, so I guess this is a first! I found the amount of names a little difficult to get to grips with to begin with, but the family tree at the start of the book was great to have as a reference and made everything fine. I love reading books where you learn something and this one taught me many things. I didn't know any of the cuture about the red tent before and women "being banished to the edge of the village" every month always seemed quite a cruel act, but I understand much more about it now. I also enjoyed reading the book and then noticing that I knew some of the names and stories from my childhood from when I went to school and learnt little stories from the bible. To have them weave together with the story of Dinah was so great! I've got scotsbookie's postal address, so I'll get it moving ASAP. Thanks Pookledo the book arrived this morning. I've got a few rings/rays with me at the moment but will get to this as soon as possible! I really enjoyed Dinah's story. As others have said the family tree at the front helped me to keep track of all the names. I was fascinated with all the details Anita Diamant gave of the encampment where Dinah lived with her mothers, Jacob & her brothers. This was waiting for me when I got home from work today, thanks scotsbookie (and Gooner of course!). This is going second on my TBR pile, am looking forward to reading it after all the good reviews it's had from everyone. Well what can I say about this book that hasn't already been said? A totally absorbing read that completely draws you into Dinah's world. It had me getting the Bible off the bookshelf this morning for the first time in years and leafing through the book of Genesis! Thanks for sharing Chris, hope you enjoy it too when you finally get to read it! Finally sent on to caroline080 today, sorry but it got tidied away over Christmas! Received in the post from WyldeTwo. Many thanks. I was brought up on Bible stories so the context was familiar, but it's a wonderful story from a different point of view. Even inspired me to re-read Genesis ch. 34 and the chapters before and after. Now in the post, on its way to Angellica. Gooner, I hope you don't mind, I re-offered this on BCUK as it was on it's last leg and there are two further participants. Thanks angellica - handed over at the Unconvention. Looks good and will put it in the foothils of Mount TBR. I know most people have enjoyed this but I just couldn't get on with it. I just didn't see them as real people at all and found it very hard to relate to them. I felt like it had been translated several times and the meanings of words had been lost. I do like historical novels, and history too, for that matter, but this one was very tedious. Hope you enjoy it more than I did candy-is-dandy as it will be on its way to you today. I've had this tooo long but have finally read it. A book about nomads that has sat in one place for almost a year - tut tut! I really enjoyed this, a well-known biblical tale, seen from a completely different perspective and expanded into a fascinating story. I liked the playing down of the Joseph story and particularly his coloured coat which was dealt with in one paragraph. I agree with others that the end of the book seemed to get bit lost but in the main I liked the descriptions of Dinah's family's way of life and the red tent. Thanks for sharing gooner. You may have to have this back now and read it yourself!! Because of unforeseen space & time restrictions, I have had to donate BC books which I registered years ago to charity shops. This is one of them.